Yeap, I did it. Straight from a twist out, I decided to wash my hair BEFORE detangling. What was I thinking? I wasn’t is the answer. I was being completely lazy and wanted it to be over. I had canceled my hair appointment and now it was on me to do the work and I wasn’t mentally prepared. My curly girls, you know what I’m talking about. I have to hype myself up for at least 2 days so I can be ready for the process. Well, I didn’t hype myself up and I went for it about 5 pm on a Saturday. I had been wearing a twist out for about a week on top of going to the gym. So let’s fast forward to after I washed it because like y’all I wanted to know just how bad it was going to be. 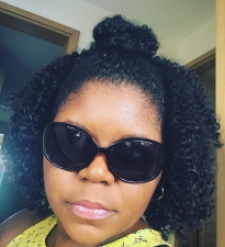 I removed my t-shirt (reduces frizz) from my hair and let out a long sigh…..
Oh but wait I have this Deva Curl product, No-Comb Detangling Spray. I said out loud “I’m putting you to the test today and you better come through for me” Nope, it’s not Deva Curl fault I didn’t detangle my hair before I washed it but I wanted it to correct my mistake. I begin to spray as my life depended on it because it really did lol. This outcome determined the future of my night and for my hair. Lawd’ don’t let me have to cut it because it’s too tangled. I WIN!!!! Deva Curl came allllll the way through. When I say my detangle process was too easy I think I’d bet on it again and not detangle. I had detangled my hair in 20 minutes with minimal shedding and I couldn’t believe it. This is my second bottle of the No-Comb Detangling Spray but I had never tested it to this extreme on my hair. Now I don’t think I could go without it. If you are looking for a good detangler, buy this right now!!! Click the link above and get it in your life. I promise on wash day the detangling process will be easier. We will still have to meditate, blast hype music, and take a nap on wash day but every little bit helps right.